I'm looking to attach a weapon to a minifig's wrist ala an Assassin's Creed hidden dagger (https://www.brickwarriors.com/hidden-blade/) or a wrist-mounted crossbow. What are my options to do this? Minifig hands, officially, are not to be removed. Lego doesn't make many accessories that fit the arms of the minifigs. The arm is slightly larger than the standard bar piece and so normal claw-shaped attachments don't fit. 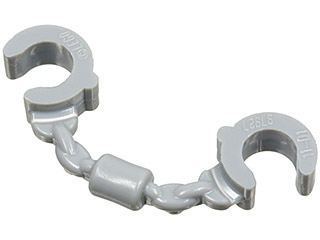 The minifig handcuff piece, which does fit over the wrist, is larger than the standard claw pieces. You'll need to look to third-party solutions like the brickwarriors piece you linked in your question, or make your own pieces. Not the answer you're looking for? Browse other questions tagged minifigures piece-usage or ask your own question. How do I make Victorian looking minifigures? What minifig configuration has been included in the most sets? What other uses are there for pull-back motors? How can I tell if my gold C-3PO minifigure is legit? What kind of design is comparable to these programming concepts?